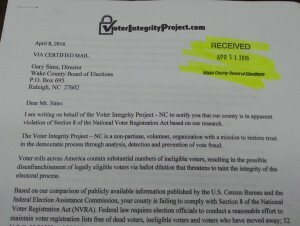 Apr 11, 2016 (RALEIGH) — The Voter Integrity Project, today notified the Wake County Board of Elections that, their office appears to be violation of Section 8 of the National Voter Registration Act (NVRA) based on research suggesting Wake county has significantly more voters on the registration rolls than it has eligible living citizen voters. The letter was also sent via certified mail. BOE stamped the letter as “Received,” by BOE Monday. For complete letter, click here. 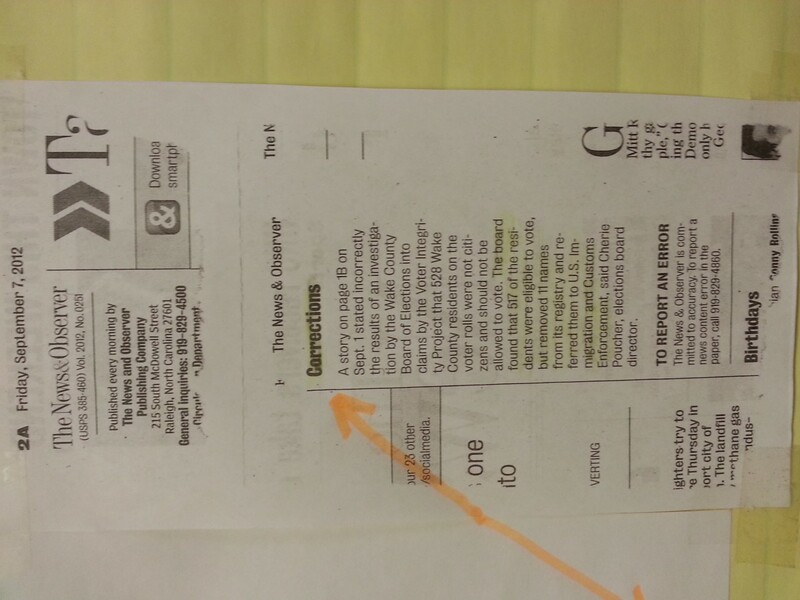 “This letter serves as the statutory notice to Wake County, required by 52 U.S.C. § 20510(b) prior to the commencement of any lawsuit in order to enforce provisions of Section 8 of the NVRA, 52 U.S.C. § 20507. “It is our hope that your county will work quickly towards full compliance with 52 U.S.C. § 20507. If not, according to the federal statute, a lawsuit under the NVRA may be filed twenty (20) days after the receipt of this notice by a private party since the NVRA contains a private right of action to enforce the provisions of the statute. For any lawsuits initiated by a private party, an award of attorney’s fees, expenses and costs incurred are available under 52 U.S.C. §20510(c). VIP was eventually able to brow beat the Raleigh N&O into running a correction, after they had erroneously claimed that none of our challenged voters were removed. They WERE removed and were referred to ICE for criminal prosecution. 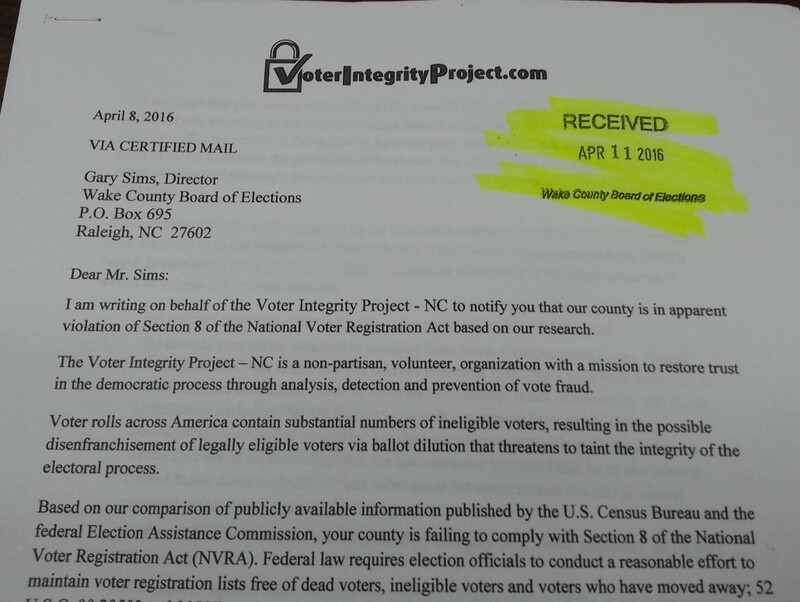 The group also requested public information from the Wake County Clerk of Courts (see link at bottom of post) that would reveal the names of voters who were more recently disqualified from jury duty by claiming they were not US citizens. This most recent request for public information was for data that had been provided to VIP as recent as in 2012. In 2012, DeLancy, challenged 553 Wake County voters, whom his group found had disqualified themselves from jury duty by claiming they were not US citizens, but the Board rejected the group’s evidence and dismissed the challenges before they later referred 11 of the voters for prosecution by Immigration and Customs Enforcement. After VIP filed the challenges, the NC Administrative Office of the Courts (AOC) devised a way to block further requests from VIP and instructed their Clerks of Courts on how to to deny VIP’s access to future requests. VIP’s DeLancy met with the AOC Deputy Legal Counsel, Pamela W. Best, who denied VIP’s access by grouping the “disqualified” jurors (defined in NCGS § 9-3) under the security procedures for each “qualified person selected for the list” (defined in NCGS § 9-4(a)). To see a PDF version of the BOE notice we gave to the BOE, please click here. To see the PDF version of the Clerk of Courts request for public information, please click here.